I am a historian and writer. From the start, I've been passionate about women's history. In the 1970s, there were only a few of us. Then local Women's History Groups sprang up. I've even kept a badge from back then, demanding 'Write women back into history'. Now, by 2019, it's become mainstream ~ as Gentleman Jack testifies. I moved to Halifax in 1980. Soon I was going down to Greenham, and writing about how suffragettes and suffragists had helped inspire the Women's Peace Camp. About Jill, suffrage. The Long Road to Greenham Common (Virago1989) won the 1990 Fawcett Book Prize. So all that kept me busy. I was also busy teaching ~ for Leeds University's adult education department. So busy that in 1984 I just noted a Guardian article, 'The two million word enigma' about Anne Lister of Shibden Hall. It told how her diaries (preserved in Archives, Halifax Library) were not only two million words long, but also her handwriting was 'one of the most illegible…and some of the diary is in code'. And it added: she 'may well have been a lesbian'. Working in adult education meant offering mature students new opportunities. So by 1988 my hectic timetable included teaching a New Opportunities for Women course in Halifax ~ introducing students to the Great 1832 Reform Act, for example. 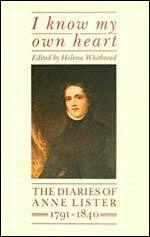 Then Helena Whitbread's I Know My Own Heart appeared (Virago 1988). Whitbread's edition of the diaries (1817-24) focussed on the coded sections, vividly detailing young Anne's love affairs with other women. Most notably with Mariana Lawton. She had made a prudent marriage to a wealthy older man; but ~ inconveniently ~ her husband would not die. This book had tremendous impact - not least in our local community. Halifax, a medium-size town, once boasting thriving textiles and engineering industries, retained extremely strong local pride. Having lived in London and Manchester, cosmopolitan cities both, I was initially hit by how traditionally-minded Halifax was. A fairly conservative (small 'c') town, feminism was only just arriving. And it was certainly not a brilliant place to be gay in. By now I was by now completely gripped. I soon began visiting the Archives, adding copies of original diary pages to my teaching material. Then in 1989, the Halifax Antiquarians Society ran a day-school in the Library on Anne. Not only did local historians talk about the earlier diary editors (before I Know My Own Heart), but also the Shibden Hall curator spoke on 'Diaries are dangerous things'. I recall extremely heated debate: indeed, blood on the Halifax Library carpet. By now my curiosity was razor sharp. I could not let this go. Not least because Anne Lister was sitting on my very doorstep. I lived in Halifax, down by the Calder & Hebble Canal. 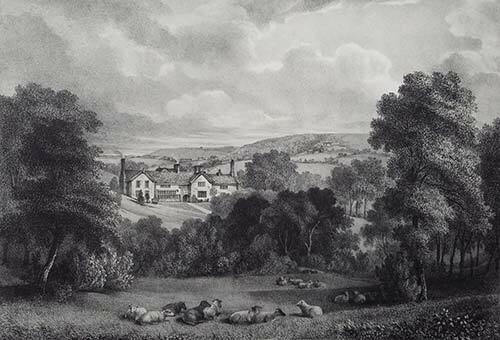 Shibden Hall was about two miles away, yet hidden from the town by a steep hillside. An energetic walker - as I soon discovered Anne Lister to be - could easily stride that distance in half-an-hour. So, rather more slowly, I walked up to Shibden's pastoral idyll. Anne Lister had me in her fierce grip! I had to plunge right in - deep. In 1990, I returned to Archives to check the Guardian's arithmetic. Could it really be two million words? Back then, the fragile diaries could only be read on microfilm. I spooled through these endless reels, methodically jotting down words-per-line (both code and handwriting), lines-per-page, pages-per-volume. By the time I got to the dense 1830s' journals, I felt my sanity seeping away. Then I did my calculations. It came to four million words! Ashen-faced, I retreated from Halifax Library. Back home, I checked my figures. 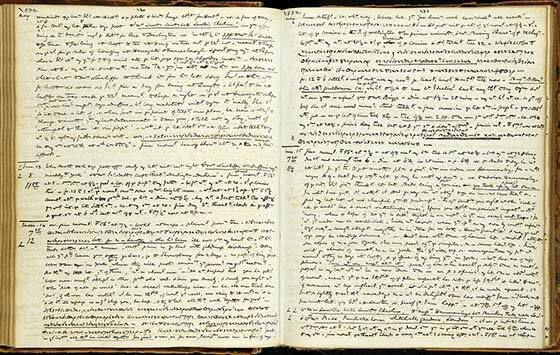 Still four million words - over three times the length of Samuel Pepys' 1660-69 diary! Of this, I calculated roughly one-sixth was written in Anne's private code. I determined to dig deeper. But first I needed a research strategy! Diary pages, 1832 May 12th-15th. Helen Whitbread had worked on the coded sections first, only then going back to Anne's heavily-abbreviated handwriting. I wondered: was this really the best way to understand Anne Lister? Focussing just on the coded sections is undoubtedly tempting. But to understand how Anne managed to do all she did, the historical context is crucial - found in the handwritten passages. 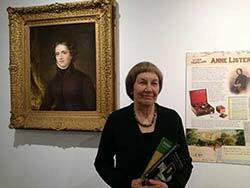 So I decided to go back, to I tell the story of the diaries' melodramatic survival after 1840 and Anne's death in remote Western Georgia. 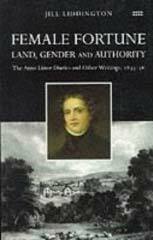 Web link to: Who was Anne Lister? So, in Presenting the Past I record the heroic achievements of earlier editors post-1840, all writing in an era when male homosexuality was criminalized and lesbianism discreetly brushed away. I also decided to plunge in deeper, selecting three sample years: 1806 onwards (earliest diaries, only just discovered); 1819, to see Anne Lister's response to Peterloo; & 1832, to check on her views on the Reform agitation. What did Anne Lister do - in 1832? 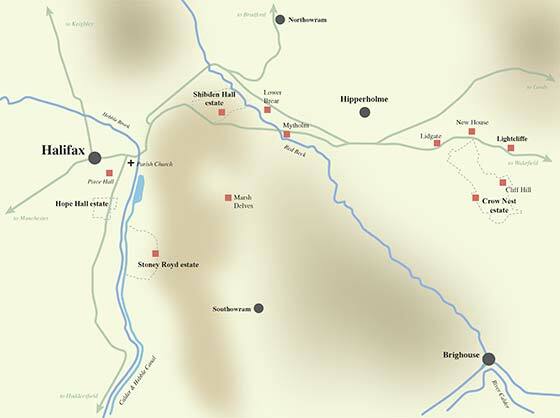 Whitbread had focussed on young Anne Lister, taking the story up to 1826 when Anne inherited Shibden. So I decided to dig yet deeper into Anne the mature diarist. I returned to 1832: after her foreign travels, she made her forlorn way back home - betrayed by yet another woman's marriage plans. And soon she met neighbouring heiress Ann Walker of Crow Nest estate. This relationship, though troubled, would change her life forever. Back in Archives, I opened up the cobwebbed Crow Nest files, to see the Walkers' take on Anne Lister. I soon found my fingers covered in dust: I was the first person ever to read them. Time passed. 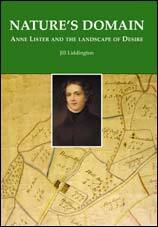 Interest in Anne Lister grew. And continued to grow. For myself, now with three Anne Lister books out, I knew I needed a break. So, with the suffragette centenary and then Vote 100 celebrations looming, I turned back to Votes for Women. In 2001, I had met scriptwriter Sally Wainwright who grew up near Halifax. 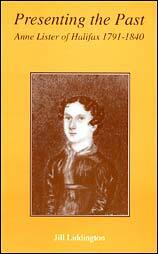 A mutual friend had given her a copy of Female Fortune - and Sally too became gripped by Anne Lister. However, the time wasn't right yet for an ambitious drama series. I was still working in Continuing Education at Leeds University, and Sally was producing a series of highly successful drama scripts. The project had to be put on hold. And now, in 2019, I'm pleased & proud Sally is bringing Anne Lister's 1830s story to an infinitely wider public than ever my books could reach. So I'm looking forward to watching the BBC1's Gentleman Jack drama series. What will television audiences, both here and globally, make of Anne Lister and all she achieved ~ in that unlikely location: Halifax, a proud, traditional, northern town? Dr Jill Liddington is an Honorary Research Fellow in the Centre for Interdisciplinary Gender Studies at the University of Leeds.